Wash drawing by Murugesa Moodaliar of the carvings of a railing crossbar from the Great Stupa of Amaravati. This is one of 42 sheets (89 drawings) depicting sculpture from Amaravati and S. India. Inscribed with numbers 2 to 90 (1 is missing) and with measurements; signed:' P. Mooroogasa Moodr', dated c.1853.The great Buddhist Stupa of Amaravati, the Maha chaitya, is one of the greatest architectural achievement of ancient India. The monument was situated on the outskirts of the town of Amaravati near the ancient ruined city of Dharanikota. It was founded in the 3rd-2nd centuries BC during Ashoka Maurya' reign and enlarged in the 1st-4th centuries AD under the Satavahana and Ikshvaku patronage. It attained the height of its glory in the 2nd century AD. It was a centre of religious activities for hundreds of years and then fell to disrepair. By the mid-1790s the ruin of the Great Stupa had deteriorated into a mound of rubble with fragments of sculpture scattered about. In 1797 the British colonel Colin Mackenzie heard about the site and visited it. He was able to return again only in March 1816. In the 19th century a series of excavations took place at the site. The monument is no longer standing at the site and has only survived in the collections of the Amaravati sculptures kept in various museums. Stupas are the most characteristic munuments of ancient Buddhism. The Mahacaitya of Amaravati consisted of a huge, solid dome standing on a cylindrical drum-like platform; the whole was surrounded by a great railing made of tall pillars separated by crossbars and crowned by a high decorated coping. The railing was completely covered with narrative reliefs and elaborate decoration. At each of the cardinal points there was a gateway. Between the railing and the drum there was a circumambulatory passageway. The enormous cylindrical drum was elaborately decorated with sculpture. The outer surface had a series of alternating slabs and pilasters. The slabs are carved in great detail with representations of the stupa and represent an invaluable source of information about the original aspect of the Great Stupa. In 1845 Sir Walter Elliot uncovered sculptures at Amaravati and sent them to Madras where they were left exposed on the green in front of the College. In 1853 the Court of Directors made enquiries about their condition and they were moved into the front entry of the newly founded Central Museum, Madras. Edward Balfour, the officer in charge of the Museum, commissioned the Rev. W. Taylor to report on them. 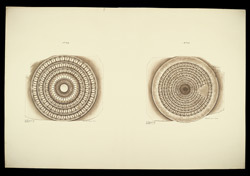 It seems probable, in view of the water-marks, that these drawings were made for the Company at this time by an Indian draftsman, Murugesa Moodaliar. In 1859, one hundred and twenty-one Amaravati sculptures were sent to London, including the ones depicted here. This drawing depicts two lotuses relieved on the inner face (No.44) and the outer face (No.45) of a railing crossbar assigned to the first phase of the High Period at Amaravati, 2nd century AD.